Arrival in Mumbai. You will be received by our tour manager and proceed to check in at hotel. In the morning, you are at leisure. Then depart for Cochin by air. Check into hotel. Afternoon tour of Cochin. In the evening enjoy a cultural dance performance. Depart for Alleppey. 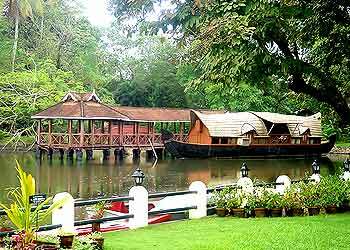 Board a houseboat at Alleppey and savor an enthralling cruise on the serene backwaters of Kerala (Whole day). Visit local villages en route. Overnight on houseboat. On arrival at Kumarakom, check into the hotel. Experience the magic of Ayurveda health therapies, yoga and meditation sessions. Experience an Ayurveda therapy in one of the most luxurious resorts in Kerala. Consult an experienced Ayurveda doctor, who will counsel you on the suitable therapies available for you. With Ayurveda Tour packages ranging from a general rejuvenation package to treatment packages for specific ailments like backache, migraine, skin problems, obesity, stress related symptoms etc. ; you find the therapy that's just right for you. Refresh your body and mind. Apart from Ayurveda, yoga and meditation, you can avail all the amenities of an international class resort - swimming, sports, cultural performances, spa facilities etc. Depart for Cochin. Board a flight for Mumbai and then take a late night flight to your home country or continue to your next destination. People wanting to just relax and enjoy silence must book Ayurveda tour packages in India from Indica Travels & Tours. This package will help you to spend some quality time in greenery and at the same time you can get benefits of the Ayurveda massage or other treatments. Kerala is the best place for Ayurveda healing of mind, body and soul. Every year, many foreign tourists come here to enjoy their vacations.